During the recent Brazil, Russia, India, China and South Africa (BRICS) Council meeting, South Africa hosted a BRICS Future Skills Challenge in Johannesburg. The challenge involved exploring skills for present and future work, particularly transforming and emerging skills in the digital, manufacturing and engineering, and transport sectors. Teams consisting of members from participating countries were assigned specific tasks with tight deadlines set by the Skills Development Working Group (SDWG). They were then judged by a panel of specialists from BRICS countries. Through this Challenge, the SDWG aimed to encourage co-operation and innovation, and to raise skills standards through the development of standard qualifications and new curricula in emerging technologies, ranging from cyber security and robotic welding to aircraft composites, to name a few. A group of students from the Discipline of Mechanical Engineering participated in the Challenge. With only a month to prepare, during which a few crash courses took place, teams that included UKZN students and members from other BRICS countries were assigned the task of designing and developing a drone and an autonomous landing/charging unit within a couple of days, with some training delivered prior to the event. 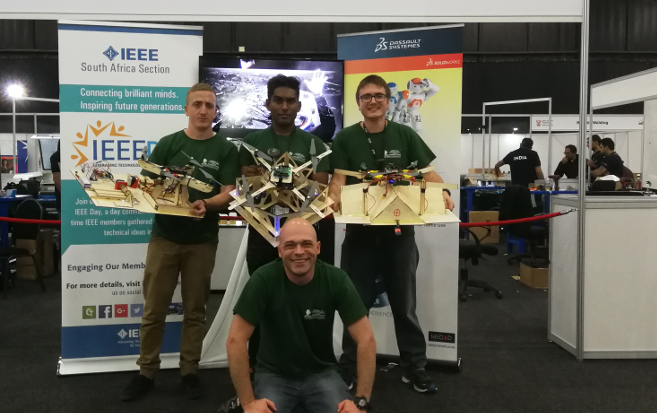 Nelson Mandela University organised many of the tasks for the Challenge, and invited UKZN to join the Drone Technology Challenge through the Robotics Association of South Africa (RASA). UKZN’s Professor Riaan Stopforth, who is involved with heading a national project for drone research, was an invited specialist to guide teams in the Challenge. Stopforth holds a remote pilot license and is a rated instructor, and he drew on experience in mechatronics, robotics and aviation disciplines to advise the students, particularly concerning regulations implemented by the Civil Aviation Authority (CAA) relating to the operation of Unmanned Aerial Vehicles (UAVs) or Remote Piloted Aerial Systems (RPAS). UKZN participants joined teams from India, Russia and China, often using Google Translate and hand gestures to overcome the language barrier. They were able to give solid advice to their teams and the groups achieved unique drone and landing/charging station designs. The 15 participants in five teams, with the help of five specialists, had a couple of days to familiarise themselves with the equipment, software, and material available. Operating on as little as four hours sleep a day, they designed and developed a drone within a day, spending the remaining time designing and developing a landing pad whereupon the drone could autonomously land and make contact with the charging point within a one square centimetre accuracy. ‘There were many challenges for the participants before the event to enable them to attend with the required knowledge, yet with their persistence, and using the opportunity to learn something new, they made it happen,’ said Stopforth. UKZN participants said one of the most important things they learnt was how to communicate with people from different countries. Teams were able to learn from one another to improve their designs, and had to devise creative solutions to construct components that were unavailable.